Why is my chlorinator showing low chlorine output on the display? This shouldn’t be confused with low chlorine readings from the pool water (which is a chemistry problem). Most modern chlorinators have a chlorine output display on the front of the power supply and often the question arises, "Why is the display showing a low chlorine output?". 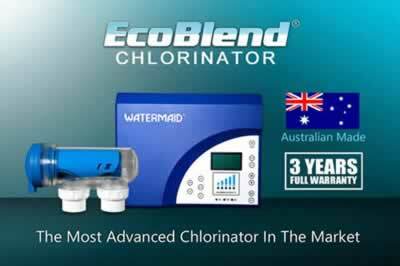 There are several reasons why the chlorinator will display a low chlorine output reading, regardless of brand. This ranks top of the list because it’s arguably the most common reason for pool owners to contact us regarding a low output on their chlorinator display. This usually occurs during the winter months when the pool water temperature is low. And the reason is that warm water is more conductive than cold water, it's as simple as that. The cold, less conductive water results in reduced current to the cell (measured in amperage) and therefore a low chlorine output reading on the chlorinator. This is not generally a problem because the chlorine demand over the winter months is significantly less. Most pools will cope with the reduced chlorine output and even reduced running times throughout winter. Did you know... that the EcoBlend® chlorinator has an in-built winter mode for use during the colder months? In this mode, the output is automatically re-scaled to a maximum of half the original specified capacity of the unit. Chlorinators require salt or minerals to be added to the pool water for electrolysis to take place. Most manufacturers specify a minimum and maximum salt or mineral level, for efficient operation of the chlorinator. If the salt or mineral level drops below the minimum specified limit, conductivity is reduced and consequently, the chlorinator output reading will decrease, regardless of the water temperature. Most modern chlorinators have a low salt warning to indicate that the salt level is critically low, but don’t rely on this! It’s like waiting for the low oil light to come on in your car before you put oil in it! It’s a good idea to get the pool water tested at any reputable pool shop once a month to ensure there is sufficent salt or minerals in the water to be able to make chlorine. Most modern chlorinators are reverse-polarity self-cleaning. Under normal chemistry conditions these cells require very little (if any) manual cleaning. However, if the water chemistry becomes out of balance, then the cell may become clogged with calcium. Excessive calcium build up can reduce conductivity, which in turn will reduce the reading on the chlorine output display. If you notice a build up of calcium in your cell, try cleaning the cell manually (please refer to the model-relevant owner's handbook for the cell cleaning procedure). Once the cell has been cleaned, check the chlorine output display for an improved output result. If there is no improvement, the cell may need replacing. The electrolytic cell is coated with several layers of precious metal coating. Over time, these layers of metal coating wear away resulting in the chlorinator display showing a significantly reduced output reading, or sometimes no output reading at all. If the power supply is in good condition, it’s simply a matter of replacing the electrolytic cell and the chlorinator will be back to its full efficiency in no time! Most modern chlorinators allow the pool owner to turn down the chlorine output. It’s easy to forget that the output has been turned down, especially over the winter months when the pool gets little attention. 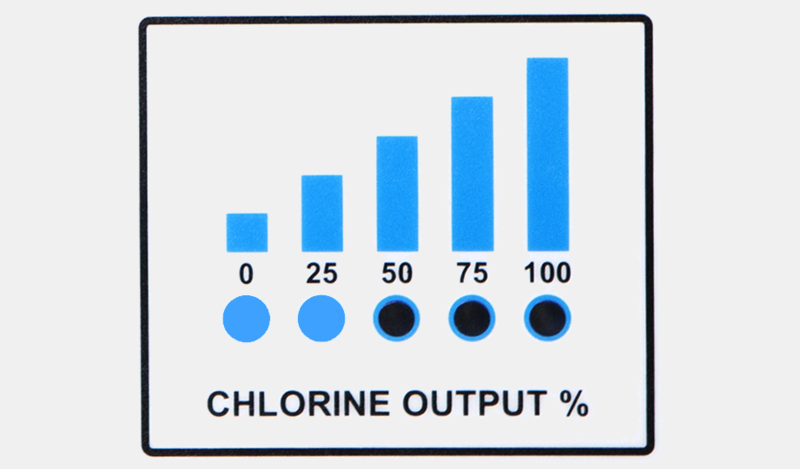 So, if the chlorine display is showing a low output, try pressing the up arrow to increase the output.